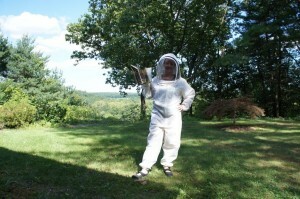 Experienced beekeepers tend to pooh-pooh protective gear (except for the veil—always necessary). Gloves make it difficult to work the bees without squishing them; bee suits are hot, bulky, and, most beekeepers think, unnecessary: the bees aren’t going to sting much if you’re gentle, and if they do—well, that’s part of keeping bees. A sting is not a big deal. I actually started out this way—I stopped wearing gloves pretty quickly, and I’ve worked the bees in just shorts and a t-shirt without getting stung. But when I DID get stung, they itched like crazy for several days, enough that it kept me up at night. So I went back to wearing my long pants and jacket. A couple of weeks ago, I went in to check the bees and ended up getting a couple of stings through my pants—one on my thigh and one on my calf. The stings themselves don’t usually bother me all that much (it’s the aftermath of itching that does), but the one on my calf HURT this time when it happened. Still, it was just a sting, so I finished my work and went back inside. Not long after, I started itching EVERYWHERE—the bottoms of my feet, palms of my hands, stomach, arms. Then I started getting what I realize now were itchy hives on my arms and side—not many, but that’s what they were. So what does this mean? Systemic reaction. I’ve never had a reaction like that to a bee sting, but it’s not a good sign. No breathing problems or anything like that, but a systemic reaction could be a lot worse next time—or it might not happen again. I don’t think I really want to take that chance, but neither am I ready to give up my bees just yet. My ankle swelled so much this time that I could barely walk on it for a day and a half, too. So I broke down and decided to order a full bee suit, perceived wimpiness or no. I researched sting-proof bee suits and found that standard suits really aren’t. In fact, there’s only one that seems to get really good reviews for relative sting-resistance. As a super bonus, it’s also really ventilated, which means it’ll be a lot more comfortable to wear in the heat than a regular suit. It’s pricey, but I decided it was worth giving it a try. Enter the Ultra Breeze. It’s essentially that rubber-mesh drawer liner sandwiched between two layers of finer mesh material. The sting-resistance comes from the fact that it’s simply too thick for most bee stingers to reach through. I’ve worn it twice—once in a very aggravated mess of bees—and so far have not been stung. So that’s a good start. It’s still hot when you’re working the bees in the sun for several hours, but it’s much cooler than my jacket/pants combo. Worth the money so far! When I first became a beekeeper I got one of these suit, simply because I wasn’t sure I was not allergic to honey bee’s. It works wonderful. I live in Florida where the temp and humidity can get unbearable but when I’m working my bees the fact that it is breathable is great. Since I received my suit I felt kind of like super women out there until I forgot to check to make sure that my zipper what under the Velcro and a few bees climbed into the head part. Yes I got stung on the face and yes it did swell up. So yes these suits are great but remember to check your zippers. I loved your story. Thank you. Oh, ow! Sorry you got stung in the face! I’m definitely sure to check my zippers. Although I did accidentally burn a small hole in the face netting with my smoker, so I need to get myself a new hood. I stuck some duct tape over it for now, but definitely need to replace! Looking good! It really does look like the drawer liner stuff inside, huh.